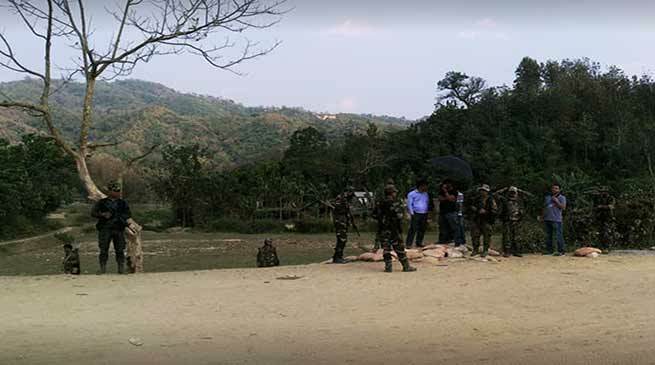 Everything was quiet along the Assam – Mizoram border front with no report of any untoward incident today. Though there were reports that MZP activists would again attempt to cross over from Mizoram side of the border to Assam today to construct the resting shed, they were conspicuous by their absence following enforcement of Section 144 by Kolasib district administration from yesterday. The Hailakandi district administration had imposed Section 144 a couple of days ago. DGP (Border) RM Singh inspected the interstate border at Kachurthal in Hailakandi district of Assam and took stock of the situation on the border front. Singh interacted with Deputy Commissioner, Hailakandi, Adil Khan, Superintendent of Police, Mohneesh Mishra and other senior officials.